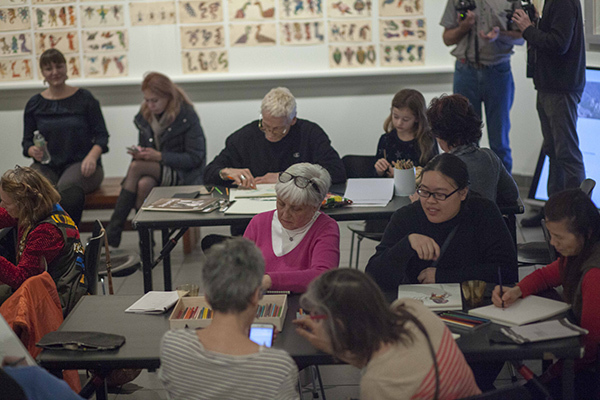 Join artist Susan Te Kahurangi King for an evening of drawing at the American Folk Art Museum. 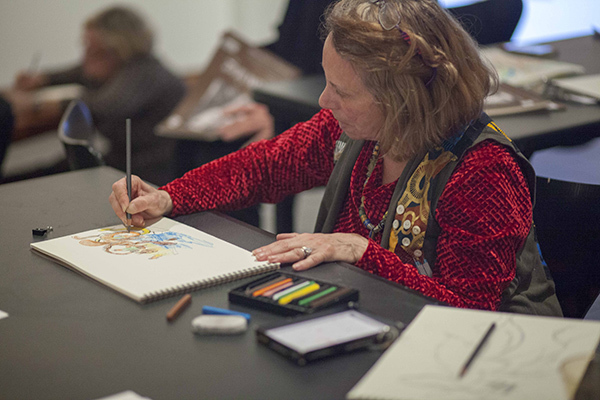 Drawing with Susan is a creative drawing workshop where participants come together to be inspired by King’s artwork and draw in a shared space. 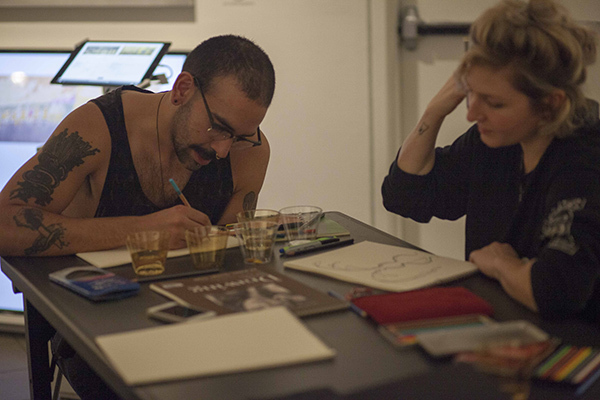 Materials will be provided; participants are encouraged to bring their personal sketchbooks. 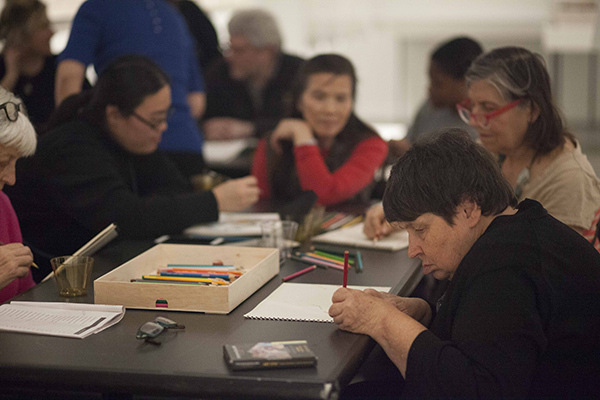 The program will begin with a conversation between archivist and King’s sister, Petita Cole, and Valérie Rousseau, Curator of Self-Taught Art and Art Brut, American Folk Art Museum. This program is being held in conjunction with the Vestiges & Verses: Notes from the Newfangled Epic exhibition, which opens on January 21, 2018. Susan King is one of the twenty-one artists featured in the exhibition. At the age of three, King loved to talk, sing, and imitate anything that she saw or heard. By the age of four, her ability to speak was in decline, and by the age of eight, it was a thing of the past. Occasionally, she would sing in bed at night, but before long, that too had stopped. Though professional advice was sought and a number of assessments made, there were no conclusive findings or a diagnosis. At the age of five, King started school. 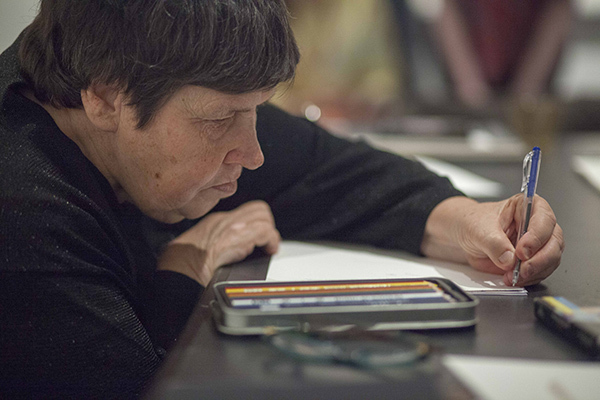 Although her stay was short, her teacher reported that Susan displayed remarkable mental activity in the creation of complicated figures drawn on paper, and that she was able to concentrate on drawing for hours at a time. As King’s inability to speak set in, so too did her heightened ability and commitment to draw. Even at the tender age of seven, she was prolific and showed signs of talent as a young artist. In 1960, the family moved to Auckland to meet King’s educational needs. She now lives in the family home of one of her sisters in Hamilton. At some stage in the very early 1990s, coinciding with a period where she was evidently feeling low, she left drawing completely. However, in 2008, fueled by renewed interest shown in her work, not long before the filming of Pictures of Susan directed by Dan Salmon (Octopus Pictures Limited, 2012), she picked up the pencil and began to draw, continuing where she had left off almost two decades prior. King’s earliest drawings share the same qualities as other children’s, save for their exceptional precocity. As one becomes acquainted with her work, the rigorousness of her visual vocabulary—which shows a disregard for and indifference to time and medium—is evident. In spite of King’s “isolation” from verbal and written communication, she has methodically created an entire analogous world through her work. After spending time reviewing the drawings and their chronology, the viewer will begin to discover visual lists, catalogs, or indexes of certain objects, which get reconfigured and distorted beyond recognition in subsequent pictures. 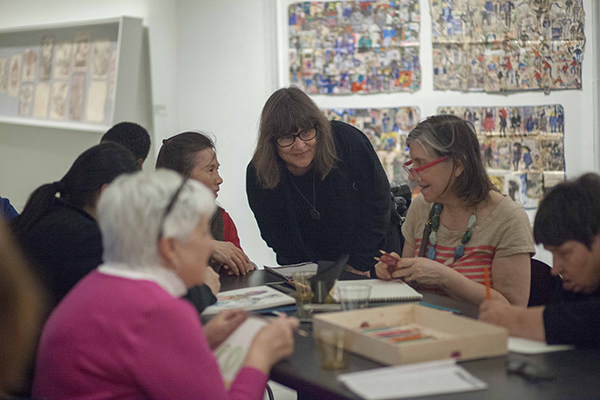 Learn about the Susan Te Kahurangi King Fellowship at the American Folk Art Museum. New research produced in the context of the Susan King Fellowship will be presented in the Vestiges & Verses: Notes from the Newfangled Epic exhibition and during the year 2018. Image credits: Susan Te Kahurangi King, Untitled, Te Aroha, New Zealand, c. 1960, crayon on paper, 13 ½ x 8 ¼ in., courtesy of the artist, Chris Byrne, and the American Folk Art Museum Susan Te Kahurangi King Fellowship, A32502. Photo by Adam Reich. Susan Te Kahurangi King, Untitled (double-sided), Te Aroha, New Zealand, c. 1960, crayon on paper, 13 ¼ x 8¼ in., courtesy of the artist, Chris Byrne, and the American Folk Art Museum Susan Te Kahurangi King Fellowship, A32417. Photo by Adam Reich. Event photos by Christine Wise.